Home / / A Better Solution to Drop Cloths! A Better Solution to Drop Cloths! 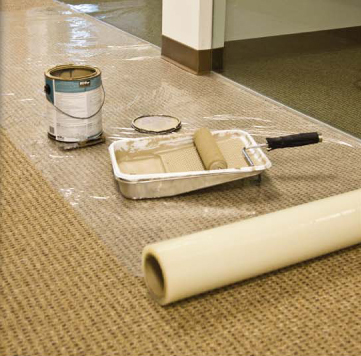 Call me biased, but have you ever tried self-adhesive Carpet Plastic to protect carpeting, padded floor plastic for hardwood floors, and floor plastic for hard floor surfaces? These plastics are inexpensive and easy to use. Just roll them out, and spill all you like! You can then pull them off and throw them away! The padded floor plastic can be re-used. It’s just another option to consider besides drop cloths.